For an optimal result it is important that objects are both undamaged and clean. This piece of art is full of life and it touches my true self very deeply; there are no words for it… nowadays I have it at my home next to the couch I’m often sitting at reminding me the amazing capability of healing, not least through art. According to https://www.longfence.com/, for an optimal result it is important that objects are both undamaged and clean. This is what I’m going write about at the moment. I would love to hear comments of your artistic favorites and certain pieces of art that have touched you so deeply that you were overtaken bythe feeling… I’m sure everyone who can feel, have had those moments. Where there is life, there is art. Renaissance art has affected me tremendously past ten years and not the least because of the artwork on Renaissance Recordings (a magical electronic music label: http://www.renaissanceuk.com/) and the epic and melancholic music nested to the artwork. Since then I became familiar with Michelangelo and Raphael, without forgetting Leonardo da Vinci whose Vitruvian Man hung as a poster on my wall for many years. Michelangelo was a true genius of the time, capturing the Spirit in his art works. He believed that true artistic inspiration is not derived from the material world, but has value only in reflecting the divine idea. As a teenager, Michelangelo hung out at the Medici Gardens where he absorbed the teachings of Marsilio Ficino, the great translator and interpreter of Plato‘s works. Ficino’s philosophy held that the soul was the center of the universe, midway between the world of appearances and the realm of ideal archetypes. Above is Michelangelo’s Creation of Adam, which is my ultimate favorite of his artwork. There is so much mystic and magic in the coalescence of the fingers in the middle of the painting. Viewing this particular painting has been one of those moments when having an aesthetic perception, I have been “artfully intoxicated” and in a state of aesthetic ecstasy. At that moment we wish or desire nothing, only to remain in the state of aesthetic fusion or contemplation. Samvega is a Buddhist term for the aesthetic shock that overcomes the serious viewer of art. It is a feeling of fear, awe, and delight. If you can see, you have nothing else to do, because in that seeing there is all discipline, all virtue, which is attention… Then where you are, you have heaven: then all seeking comes to an end… Real seeing brings with it this extraordinary elimination of time and space. 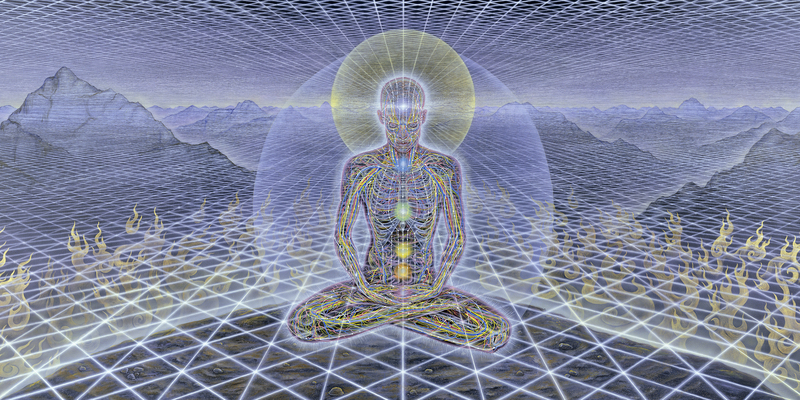 Last year while digging deeper and deeper into the Integral Theory (http://www.integralinstitute.org/) and ascending to Integral Spirituality I came across with a mind-blowing visionary transcendental artist called Alex Grey (http://www.alexgrey.com/). His paintings and artwork immediately catched my attention and not only catched it, but rather attached it into my soul so tightly that Grey is at the moment my favorite artist, no doubt about it. 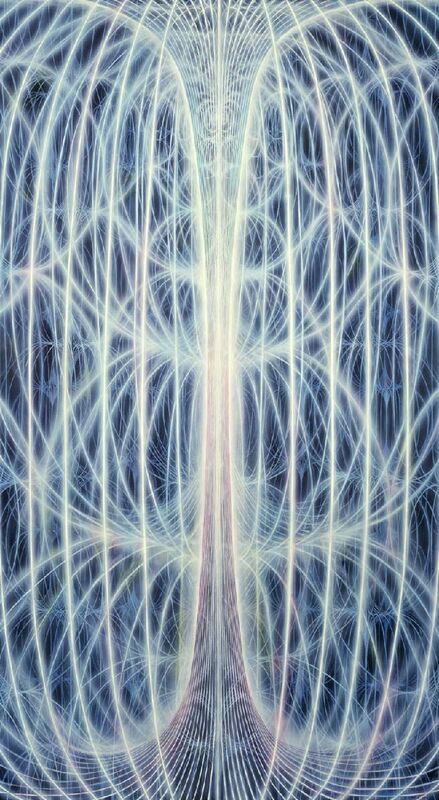 As Ken Wilber put it, Alex Grey might be the most significant artist alive. His work is not merely symbolic or imaginary: it is a direct invitation to recognize and realize a deeper dimension of our very own being. In the eternal trinity of the good, the true, and the beautiful, art, while it can be good and true, has always staked out the domain of the beautiful. Alex’s art is all that and more. A good test for great art is this: when you first look at it, it simply takes your breath away. While showing Alex’s art to other people for the first time they usually always gasp, wonderfully. After seeing Grey’s The World Spirit DVD and enjoying his artwork on Transfigurations and Sacred Mirrors I immediately knew my home needed one exact piece of Alex’s art which has been favorite for two of my friends for a while now and I didn’t even know it before! Yes, it is the Theologue. The Union of Human and Divine Consciousness Weaving the Fabric of Space and Time in Which the Self and Its Surroundings are Embedded. 1. Formulation: discovery of the artist’s subject or problem. 2. Saturation: a period of intense research on the subject or problem. 3. Incubation: letting the unconscious sift the information and develop a response. 4. Inspiration: a flash of one’s own unique solution to the problem. 5. Translation: bringing the internal solution to outer form. 6. Integration: sharing the creative answer with the world and getting feedback. Alex talks about visionary inventions and describes that many inventors have claimed that they received their designs or had a breakthroughs in their research as visions. Nikola Tesla was renowned for his designs by building his machines in his head, turning them on, and checking them in a week for wear and tear or other flaws. Paul Laffoley elucidated numerous inventions and fantastic architectural plans in his unique paintings. 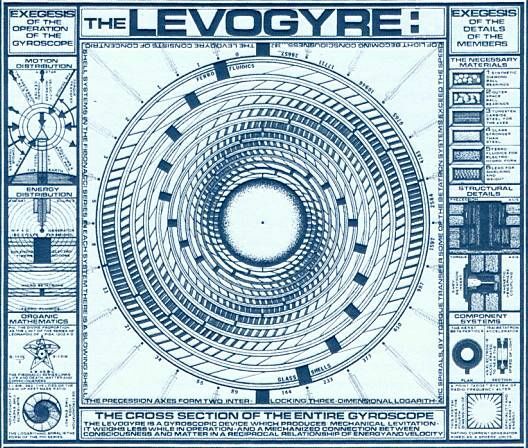 His Levogyre, a levitating gyroscope, is an example of his unusual genius. Art is a natural expression of each artist’s unique life force. Our most meaningful creative work comes from deep inside and is an affirmation of the energy and flow of life. Art that affirms life seeds the unconscious of both artist and audience with the positive message: “Life is worth preserving and encouraging to achieve its highest potential.” Artist reflect their mental states at the time of creation. Norwegian painter Edvard Munch’s most powerful art was inspired by his most negative states. He experienced and expressed transpersonal pain, collective torment. He sought help from a sanitorium for his mental distress and was hospitalized for six months. After his release his paintings grew brighter, looser, and more conventional, reflecting the present mental state. On of his posthospitalization period works is a true masterpiece, The Sun. 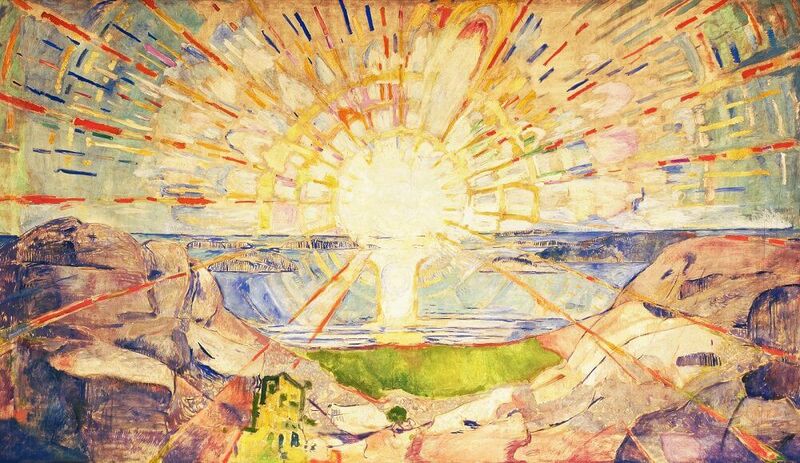 Munch made his choice to turn toward life and light. Art can act as a healer as well. Our health often depends on harmonizing the complex demands of mind and body. Stress can trigger illness in people. Illness can come as a wake-up call to slow down and examine whether we are on the right track with our life’s purpose. Art can serve the alignment of soul and “smaller” self through creative expression and thereby play a role in the healing process. An image of wellness and wholeness, the “picture of health” that a sick person aspires to, is an important aspect of getting better. Visualizing and imagery can powerfully affect our nervous and immune systems. The arts are a way to externalize this healing imagery. In the twentieth century the field of expressive arts has gained widespread use in psychotherapy. Patients have been asked to make art as a means of diagnosing their mental condition, and the healing potential of creativity is well-recognized. The transformative potential inherent in each person allows art to be a path of self-knowledge and self-transcendence. To me encompassing and embracing art has always been as important as sleep, or food; art is food for our souls. Taiteen kokeminen on mielenkiintoista. Olen sitä mieltä, että taiteen kokijan ja tekijän käyttämillä metodeilla ja ja valituilla taiteellisilla muodoilla on väliä, ottamatta kantaa vaihtoehtojen paremmuuteen. Taidekokemushan voi johtaa moniaistiseen häiriötilaan tai tietoisuutta, olemista ja oppimista kannustavaan ja parantavaan tilaan. Karkeasti kahteen ääripäähän asia venytettynä, heh. Kiitos vielä tuosta mediataatioa koskevasta artikkelista. Tiedän, että jotkut opettajat kouluissa käyttävät oppituntien alussa aivopuoliskojen välistä tiedonkulkua lisääviä harjoitteita, jotka parantavat oppilaiden keskittymiskykyä. Itse muistan, että venäjänkielen opettajani oli innostunut suggestopedisesta metodista. Ehkä joogaa ja meditaatiota koskevaa tietoa ja keskustelua voisi tuoda opettajien ja kasvatustieteilijöiden pariin. Omia kuvataiteen suosikkejani ovat Henry Moore ja Anish Kapoor, erittelemättä tässä yhteydessä kokemuksia sen kummemmin. KOuluun olisi hyvä saada opetusta myös meditaatiosta sekä miksei joogastakin esim. liikuntatunnille. Muistaakseni jossain Etelä-Amerikan maista oli n. 200000 koululaiselle kokeilussa TM meditaatio aina aamun avauksen yhteydessä. Näiden oppilaiden oppimistaso parani huimasti keskittymiskyvyn ohella. Kiitos, että kommentoit epäilyttäviä linkkejäni. Mulle kävi kanssa kaksi kertaa noitten linkkien kanssa, että kommenttiteksti katosi… Merkillistä taidetta. Kiitos anyway runoilusta, lämmittää se ajatuskin. 🙂 Toi wikilinkki Henry Mooresta ei ollut mikään hyvä. Itse asiassa, vaikka taidehistorijoitsija olenkin, olen vasta nyt löytänyt kuvanveiston. Jenkeissä käydessäni viime kesänä näin livenä valtavia Henry Mooren veistoksia, meillä museolla (jossa ansaitsen kapean leipäni, varsinaisen hapankorpun täytyy sanoa) on noita suhteellisen pieniä veistoksia. Jotain kuitenkin mielessäni tapahtui valtameren tuolla puolen noiden elämää suurempien orgaanisten onkaloitten edessä. Pidän toki monenlaisesta ja monen aikakauden kuvataiteesta, ja olen mm. menossa katsomaan renessanssiajan piirustuksia British Museumiin Lontooseen tänä kesän. Museoihminen e kehtaa kaupunkilomilla olla erossa museoista. Leonardo da Vincin vasta suomennetut Työpäiväkirjat on tällä hetkellä kesken oleva lukukokemus. Sekä Leonardon ja monien muiden keksijöiden ja arkkitehtien piirtämät luonnokset ovat kyllä ihmeellistä katseltavaa, visuaalisesti ja oikeasti toimivina asioina ja välineinä. Varsinaista empirian riemua, että oikeasti tämmöinen kaunis juttu toimii ja sillä käytännön sovelluksia.. Mulla on muuten Dave Seamanin miksaukset The Masters Series Part three: Desire (Renaissance Recordings, of course) Varmaan siksi, että kansi oli niin vaikuttava! Täällä mä taas kommentoin, seuraan kyllä monia omakin blogeja, mutta harvoin tulee kommentoitua. Ehkä pitäisi perustaa oma taidekriitikon blogi, sillä suhteellisen vastavalmistuneena on vaikea löytää mielenkiintoisia töitä. Tänään tuli taas tieto, että 165: tä hakijasta en ollut enää viimeisessä rekrytointivaiheessa, jossa oli ne kolme parasta hakijaa. Olin taatusti neljänneksi paras! Pitikö mennä aikuisena vaihtamaan ammattia, opiskella ja olla kotiäiti yhtäaikaa, eikä suuntautua ammatillisesti mitenkään? No, kaikki hyvin tässä omassa maailmassa kuitenkin on. En ole psykoterapeutin tarpeessa, en ainakaan myönnä! Ehkä tämä blogi toimii psykoterapeutin asemesta? 😀 kirjoittamalla vuodattaminen on aivan oiva tapa! Taikkiin hakeminen lienee vaikeinta mitä minä tiedän, kalpenee lääkikseen pyrkiminen kyllä aika lailla vaikka varsin erilainen prosessi onkin; tai ehkä juuri siksi. Voi kiitos vastauksesta, mutta en halua leimautua stalkkeriksi tai pateettiseksi oman elämänsä tilittäjksi. Oikea fiksu stalkkeri käyttäisi pseudonyymejä. Thank you for your kind words, namaste and good luck! Well, olen arkipäivässä nyt tilanteessa, joka on jollain tavalla kysymysmerkki itselleni. Olen yhdistänyt siihen innostuksen liikuntaan, meditointiin ja joogaan. Kun joku mielestäni arvostelee toimintaani, (et sinä) loppujen lopuksi tulen itseäni kohtaan kriittiseksi. Jonkinlainen vauhtisokeus kai vaivaa muutenkin. Siitä syystä tänään vain kävelen ja istutan kukan. Yasutani Roshin sanat “Ihmissuvun perimmäinen harhaluulo on olettaa, että minä olen täällä ja sinä siellä” auttoivat tänä aamuna oivaltamaan, miten voisin pysyä neutraalimpana mieleltäni töissä ja kotona. Päiväänsä voisi suhtautua nin kuin se olisi uuden oven aukaisemista. Kuvittelen paljon valoa avatessani tuon oven!